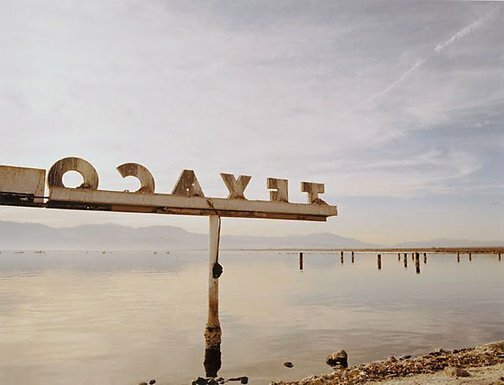 Salton Sea is a decayed part of the United States - a failed development which was built to rival Palm Springs. The accidental flooding of the desert led developers to believe the area could be populated but the waters were toxic. The area had been partially built but now lies abandoned. Corridore's photographs depict the eerie and post-apocalyptic nature of the landscape: beautiful but desolate. Signed l.r. verso, pencil "M. Corridore". Dated l.l. verso, pencil "....FEB 99".